We all know that self-help books can sometimes take on a blaming tone (i.e., fix yourself, fix your life, fix your problems), but Brendon tackles the subject of personal empowerment in a much more refreshing way: He encourages us to step out of victim mode and into the true freedom of authentic self-expression. You’ve had “the power” all along, and leveraging it for a rich and juicy life means you stop shying away from your magnificence and you start owning it in every possible way. The time to slay your demons is now. What if you lived your life fully aware of, yet uninhibited by, the fears and doubts that hold you down? Brendon suggests that forces inside of us tend to sabotage our freedom, and it’s our job to get to know these demons. When we can recognize them intimately and see them in all of their disguises (fear, addiction, greed, etc. ), we can better defend ourselves against them. Slowing down is critical to your well-being. I always emphasize the importance of stress management when it comes to physical, emotional, and mental health, and this is also a recurring theme in “The Motivation Manifesto.” As Brendon puts it, “Life is meant to be a vibrant, deeply felt, growing mosaic of long, meaningful moments.” The cost of not slowing down is grave: we give up deep relationships, peace of mind, a healthy body, and fully enjoying sensory input the way we could be. If we don’t learn to slow down, we run the risk of losing important pieces of our lives. If you want to be happy, you need to reclaim your purpose. It can be an uncomfortable thing to admit that we’ve chosen lives that don’t match up to our true calling, purpose, or desire. The simple solution is to start designing your existence based around the pursuits that make you feel alive—a concept Brendon calls “reclaiming your agenda.” No one else gets to determine that agenda, and you are the author of that document. If you’re truly honest with yourself, what would yours say? Daily joy is key. “Fun” has become a four-letter word in our culture. We sometimes equate it with slacking off or somehow neglecting our responsibilities. However, joy is crucial to our sanity, and the book also discusses how we need to protect our right to laughter, passion, humor, and silliness. Keeping the spark alive in our hearts, our relationships, our careers, and our hobbies is what reconnects us to the magic of life. 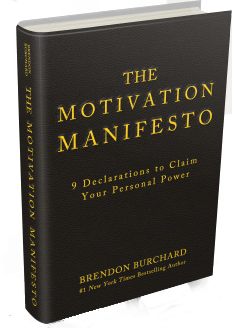 “The Motivation Manifesto” is such a complement to the work you might already being doing on your physical health. It gives you a way to tap into the theme of self-investment; that is, sustaining the thoughts, beliefs, and habits that help you live the life you truly want. Here’s a link to a page where you can get your own copy of the book, as well as a 12-week course that comes with it. Go grab one now, as the copies are limited, and you won’t want to miss out on this book! It may become a mainstay on my nightstand.